Seventeen years after its inception, WebMD remains one of the go-to resources for basic health and diagnostic information (and hypochondria enablement) on the Web. Born at the height of the Dot-com Boom, WebMD is on a very short list of companies that were able to not only endure the ensuing crash, but go on to achieve profitability, a billion-dollar market cap and maintain their position as a market leader — even today. It’s been a bumpy road for WebMD, however, and the potholes ahead aren’t getting any smaller. As the transformation of the healthcare industry accelerates, the threats to WebMD’s business and its position atop the food chain have begun to multiply. Though WebMD announced today that its health network saw 138 million unique visitors per month and total traffic of 2.95 billion page views during the third quarter — after reporting its first profit in six quarters in July — its popularity has wavered over the last decade. At times, WebMD has been more punchline than pioneer. 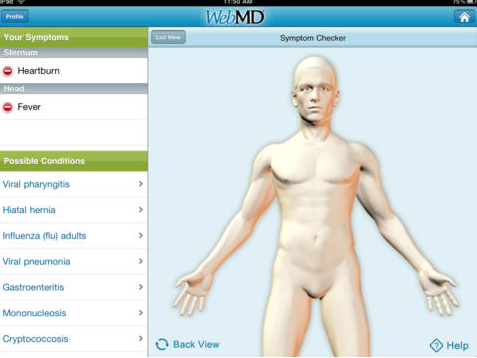 Today, WebMD is primarily known for its consumer-facing health and diagnostic web portal and mobile apps. When you think of WebMD, you think of its classic symptom checker, where you can enter in keywords like “runny nose,” whereupon it will serve you with possible diagnostic matches. However, over the years, the company has been quietly diversifying, adding services that allow it to reach new audiences. Through Medscape, for example, the company offers medical news and information to healthcare providers through its registration-based portal and apps. In turn, WebMD has also begun to target employers and health plans with its subscription-based patient engagement platform and private online health portals, which give employees a secure gateway through which they can access their personal health information, plan data and insurance claims. While WebMD has build a solid foundation around its flagship health information site, each of these services still live apart from each other. As people continue to adopt and become comfortable using a wide range of digital health tools, the opportunities for patients and healthcare providers to connect and communicate, for patients to take control of (and better monitor) their healthcare will increase exponentially. If WebMD is going to continue to be a part of the conversation in the emergent HealthCare 2.0 Era, it’s going to have to step up its game and adapt to these changes. What’s more, WebMD has business model that’s very much centered on advertising. Where the pharmaceutical industry goes — its primary source of advertising dollars — so goes WebMD. But, as the company looks to close the gap between its consumer-facing apps and services and its provider-facing portal by allowing doctors to push content to their patients’ phones, for example, opportunities begin to present themselves. By giving doctors the ability to prescribe educational material and content across apps, stepping into personalized healthcare information services and behavior change, WebMD could be able to reduce its reliance on advertising. Looking forward, WebMD will continue to deliver its core media services, but perhaps more critical to its survival will be the process of redefining itself as a health technology company. To do so, WebMD took its first step in that direction today with the announcement that it will be acquiring TechCrunch Disrupt finalist and the maker of “Patient Relationship Management” (or “PRM”) software, Avado. Like healthcare itself, WebMD has historically tailored its products to address the two very distinct “worlds” within the system: The consumer world and the professional world. Traditionally, it was as if these two divisions were separated by 30+, New York City blocks. With its first acquisition in five years, WebMD is looking for Avado to both metaphorically and physically become the connective tissue between its offices and between its customers — consumers, patients and doctors. 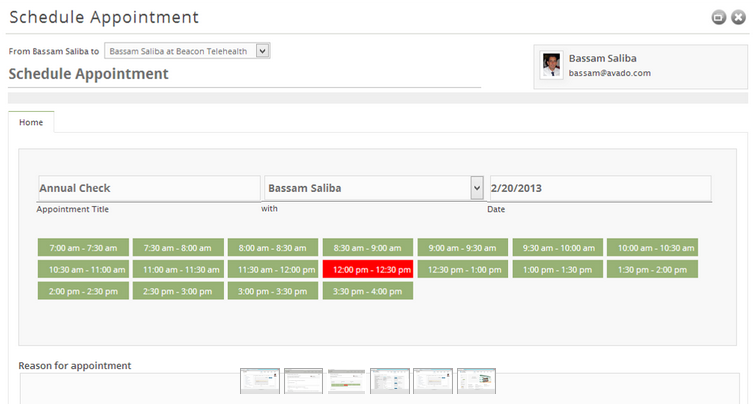 Since launching in 2011, Avado founders and Microsoft veterans Dave Chase, Bassam Saliba and John Yii have sought to do for healthcare and personal health records what Salesforce has done for Customer Relationship Management (CRM). [Disclosure: Dave Chase has contributed a number of articles on the HealthTech space to TechCrunch over the years.] The idea, Chase says, has been to increase the level of connectivity between healthcare providers and consumers to make the delivery of care more efficient and improve patient outcomes. While the companies aren’t yet ready to talk about the new products that are on the roadmap in the wake of the acquisition, Pence did say that these products will directly integrate Avado’s technology. Beyond that, as to what will become of Avado once it’s folded into the WebMD ecosystem, Chase says that Avado will take up residence within WebMD’s technology team, currently a small but growing portion of the company’s 1,600 employees. Avado founders Chase and Saliba will be staying on after the acquisition, and will be reporting to Pence. The other members of the Avado team will also join WebMD’s tech team and will remain at their company headquarters in Seattle. While the two companies declined to share details in regard to the terms of the acquisition, TechCrunch sources close to the deal said that the price fell in the $20 million to $30 million range and was a positive outcome both for the founders and for its investors. Avado raised $1 million back in March from investors that include The Partnership Fund for New York City and healthcare angels like Andy Palmer and QxMD founder Dr. Daniel Schwartz. Though Avado managed to secure outside investment and attract “hundreds” of healthcare provider customers and “many thousands” of consumers, its traction is minuscule in juxtaposition with WebMD. While WebMD may not be the sexiest brand in healthcare, it reaches the largest audience of health-focused consumers and healthcare providers in the U.S., Chase said. And therein lies the real value of this outcome for Avado — the opportunity to not only help WebMD in its plans to build the “Health Graph” and integrate its technology into a larger suite of connectivity and patient-empowerment services, but reach an audience of (hundreds of) millions. On the other hand, while WebMD finds itself back in the black and holding fast to its position in the market, the online consumer healthcare pioneer is at a crossroads. Yes, they have a long reach, but without talent that can help it build third party ecosystems, WebMD risks missing a big opportunity. WebMD is eager to reposition itself and transform itself from a digital media company to a health technology company, and, in particular, become a true patient engagement platform. Avado believes it can help WebMD shave two years off of that transition. Integrating Salesforce-like patient empowerment software (and APIs) into its portfolio and infrastructure are the first real step in that new direction. For more, find the acquisition announcement here.